jeudi 9 janvier 2014, par Julia Duchemin. You have been missing it for a whole year now, but the Fish & Chips festival is back at Atelier 231 to haunt your January nights in 2014. Fear not, it is for the good of all, of families, of night owls, of England lovers or of those who are merely curious to meet artists from over the Channel. 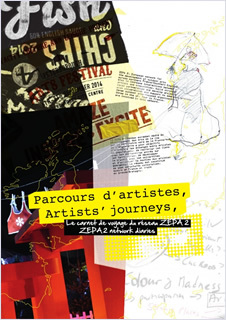 This year, the programme has been arranged with Maggie Clarke from Manchester, high priestess of Without Walls in England, in association with Atelier 231 as part of the ZEPA 2 European project. We will set the scene with Carabosse’s fire installations and an original scenery imagined by the young creators from Rouen and Winchester art schools, steered by the visual artist Fabrice Deperrois, not forgetting Atelier 231’s restaurant turned into the Red Lion Pub in no time at all by the Strangelings… So British atmosphere guaranteed ! Wednesday will be a special time for families and children. Around the Total Crêpes, several shows will be performed both outside and inside – in the warm – from 3.30pm. On Thursday and Friday evenings, Brigitte and Didier will ensure the abundance of food. The now unrivalled and delicious Atelier 231’s fish and chips will be served at the Cod Father. You’ll walk around the Promenade des Anglais along colourful artists, you’ll bump into talented companies ready to do (almost) anything to seduce you : Artizani’s punt, the animal warmth of Thingumajig or Creature Feature, the mystic science of Avanti Display or even the otherworldly adventures to where Pif-Paf will take you. On Friday, don’t be afraid to have your picture taken by the Cubiténistes, these philosophers of the absurd who turn the audience into a work of art. For the braves, I recommend a tour of the Great British Sauna, an ideal spot for unexpected encounters. In the Tender, on both evenings, come and live an edge of your seat experience like no other, see the impossible becoming possible with the new show from Slightly Fat Features, “Varietyville”, a riotous comedy cabaret to be urgently prescribed. Outside, at the end of the evening, you will follow the fire and flames parade of La Salamandre. Music at last in the Red Lion Pub with Dr Butler’s Hatstand Medecine Band and Mikey Martin from Norwich as a trendy DJ. Don’t forget to bring a warm coat to enjoy this little Anglo-French delirium in the best conditions possible. Daniel Andrieu, Directeur de l’Atelier 231.